This book is a fantastic story that will keep you on your toes second guessing everything you thought you knew about everything. It is a delight to read and was so very hard to put down. I never wanted it to be over. Looking forward to reading the sequal. 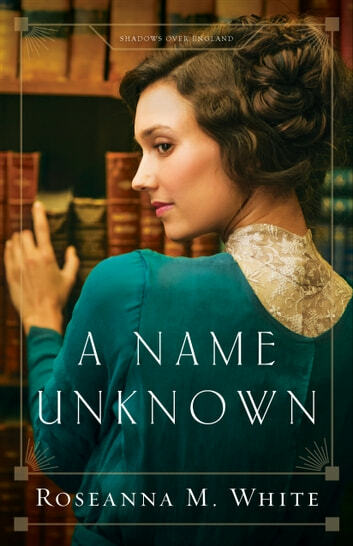 A Name Unknown by Roseanna M. White is an amazingly captivating World War I romance. Rosemary Gresham is a young woman who has grown up on the streets of London in a survival of the fittest kind of life. She provides for her family of twelve urchin orphans by being a thief, a good thief, one of the best in England--blending in and taking things from the 'rich blokes'. With the promise of a large sum of money, she has been commissioned as a librarian to basically spy on Peter Holstein, a rich bloke with a German name. Can she find evidence to name him a spy? As the storms of war between England and Germany gather, an Englishman having a German name and ties with Germany is a suspicious individual. Will his silver spoon protect him when war breaks out? If he is a spy, he is a master at it. Why does he have access to the king? What is the secret he desperately tries to keep from all but a chosen few? What will he do when he finds out who she really is? The author has given her vibrant characters depth and realism and portrayed their inner feelings profoundly allowing those emotions to resonate within the reader. I love how the author has Rosemary and Peter communicating through daily written notes even though they see each other all throughout the day. Rosemary sees how Peter believes in a God who hears prayers. Would God ever listen to her prayers or does he only answer the prayers of the rich? The journey of faith depicted is genuine, realistic and clear. Will Rosemary be able to learn that she alone cannot fix everything? The tidbits of the history of the WWI era expertly threaded through the book are an interesting addition. The story moves quickly with twists and turns to the plot and lots of action--finishing the book kept me up til the wee hours of the morning. I am really looking forward to the next book in this Shadows Over England series. I received a complimentary copy of this book from Bethany House Publishers via CelebrateLit. A favorable review was not required and opinions are my own. This review is part of a CelebrateLit blog tour.